AGENTS’ 80/20 PRINCIPLE: FINDING INSURERS THAT POWER GROWTH - The Rough Notes Company Inc. Almost 100 years ago, Italian economist Vilfredo Pareto observed that 20% of the pea pods in his garden produced 80% of the peas. He expanded his view and discerned that this 80/20 distribution was present throughout nature. Pareto went on to note that this ratio was common in society as well, as 20% of Italy’s population owned 80% of the land. These observations and others like them led to what became known as the Pareto Principle. The Pareto Principle implies that most things in the world are not distributed evenly. Following this principle, in any given task, 20% of the effort generally produces 80% of the output. The same can apply to sales, employees, and even smartphone users—and many can attest that they use only a fraction of the apps they download. If insurers want to compete, they must acknowledge an agent’s role as a strategic business partner because their success often depends on your success. For independent agents, the Pareto Principle can be a powerful growth tool. The principle can help clarify where an agent should deploy time and effort. Agents should understand what tasks and functions create the strongest results and realize that some day-to-day tasks are nonessential. They then can focus efforts and energy on high-value tasks and strategies that lead to the most meaningful results. Forty-two percent of agents who responded said that when seeking a quote, they request responses from only three insurers. Ten percent of respondents indicated that they seek quotes from more than five insurers. Comparing three quotes usually is an efficient use of time, whereas comparing five or more tends to be unwieldy and ineffective. Using three quotes often means a quicker turnaround to the client; and the faster the information is presented to the client, the faster those policies can be issued. Because speed is essential and time is precious, agents need to make sure that quotes from insurers are delivered quickly. In Verisk’s survey, 33% of agents indicated that speed to quote is the most critical factor when they are deciding whether to work with an insurer. Agents want to find insurers that reduce manual tasks and redundant data entry to provide real-time quoting. The key is to identify that universe of insurers and work with them. Of course, speed without accuracy can set a collision course with disaster if what an agent delivers doesn’t meet a client’s expectations. No agent wants to jeopardize client relationships by presenting rushed or inaccurate quotes. Quotes must be both complete and correct. A full 36% of survey respondents said accuracy was the leading criterion they used to select an insurer. Respondents also said the quotes they receive from insurers are inaccurate 41% of the time. When quoting commercial policies, there are many opportunities for errors: a business location, NAICS code, or business owner information could be wrong. These scenarios can disappoint a customer and result in lost business. Agents need to ascertain which insurers in the pool consistently provide accurate quotes—and then respond quickly. Almost everyone hates overly complicated processes. Think of the hassle involved in renewing a driver’s license or getting a passport. Both involve filling out forms with multiple fields and convoluted instructions. And if applicants forget to check a box or happen to write on the wrong line, they usually have to start all over again. In the same way, some insurers’ processes are also unnecessarily complex. Twenty percent of survey respondents found this was a major pain point. A busy agent doesn’t have time to enter 17 fields across four different screens just to get to a quote. It follows that agents need to work with insurers that have simple, intuitive quote-generating processes. Spending time providing extraneous data to receive a quote accomplishes just one thing—it costs money. Over time, it pays to work with insurers that have a simple procedure for returning accurate quotes quickly. As can be seen, narrowing the field of insurers to a short list of top performers—call it an agent’s “Pareto 20%”—can provide the speed, accuracy, and simplicity needed to make the job easier and get strong quotes to customers quickly. Agents hold the cards here; many insurers need to work with agents to meet aggressive revenue growth goals. If insurers want to compete, they must acknowledge an agent’s role as a strategic business partner because their success often depends on your success. The Pareto Principle is also known as “the law of the vital few.” In the highly competitive insurance marketplace, concentrating on the vital few can be the difference between focusing efforts intelligently and wasting time and energy better spent on making sales and satisfying customers. In this way, agents can often achieve Pareto efficiency (also known as Pareto optimality), an economic state in which resources are allocated in the most efficient manner. 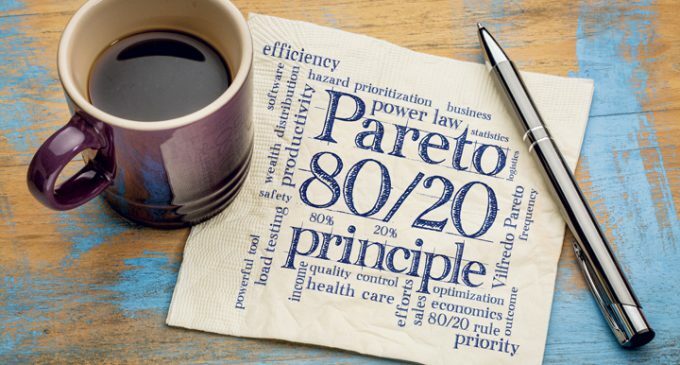 Since Vilfredo Pareto discovered the 80/20 rule, it has proved to be a valuable tool for businesses in all industries to sharpen marketing and business plans, increase efficiency, avoid waste, and grow the bottom line. When using the Pareto Principle, agents can discover the “20%” of insurers that are easy to work with and focus on those that consistently return accurate and speedy quotes. These are the business partners that can make it easy to do your job. Cultivate them, work with them, and grow with them—use the Pareto Principle to help achieve greater success. Rick Stoll is vice president of commercial lines underwriting products for ISO, a Verisk (Nasdaq:VRSK) business.